On January 30, the January 2013 Class and Component Prices were announced. 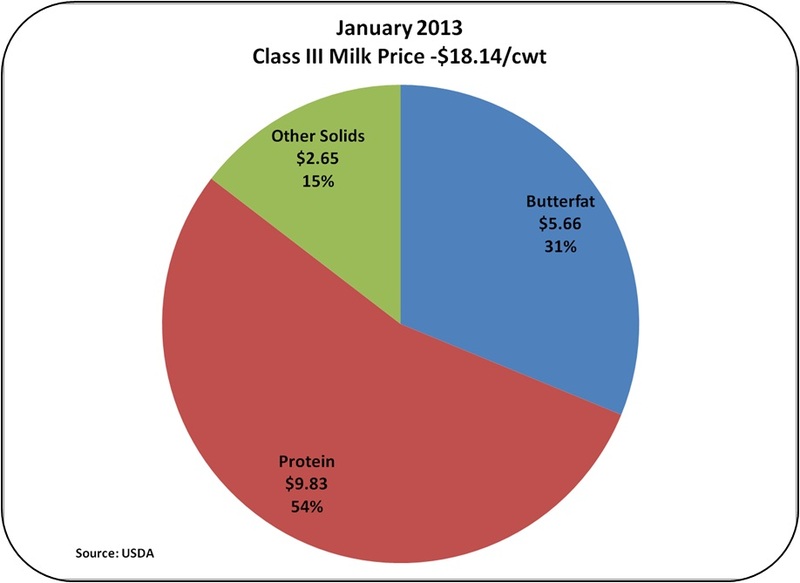 The Class III milk price for January is $18.14/cwt, down $.52 or 3% from the prior month. There is currently some weakening in exports which is causing cheese and butter inventories to grow and prices to decline as supply outweighs demand. Fortunately, exchange rates are increasingly favorable for exports, so the downward trend in exports should be reversed soon. The value of "Other Solids" remains high. The price for dry whey which is used to calculate the price of "Other Solids" was $.65/lb, down one cent from the prior month. Payment for milk protein continues to dominate milk payments. Based on Class III pricing formulas, payment for protein made up 54% of the milk check. "Other Solids" continue to be important as the value of whey continues at record highs. Want to know how to maximize milk protein from dairy cows? Dr. Daniel Luchini makes regular posts to his Technical SmartMail blog where he reviews the latest research and technical information in the science of amino acid balancing for dairy rations. Amino Acids are the building blocks of milk protein and Dr. Luchini's blog provides a quick update of the latest science. Be sure to fill in your email address on the right side of his blog to receive notices of new posts. "Other Solids" are the smallest contributor to the milk check, but they have become a very positive game changer. If we look back just five years, "Other Solids" were worthless. 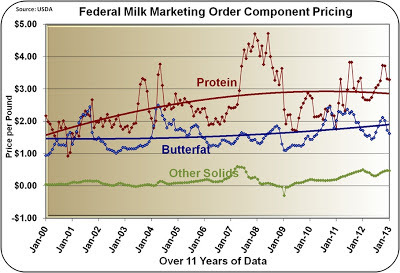 In 2008 and early 2009, they ranged in value from a high of $.20/lb to a low of -$.30/lb. Yes, that is a minus sign on the low number, meaning it cost more to dry and sell whey than it could be sold for. On average in 2012, dry whey sold for $.59/lb and in January 2013 it was valued at $.65/lb. 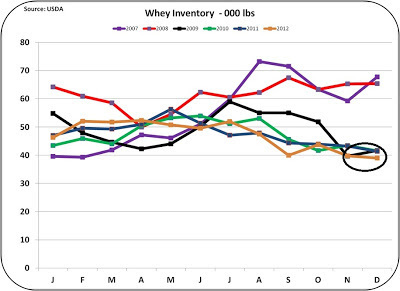 Inventories of dry whey remain at record low levels. 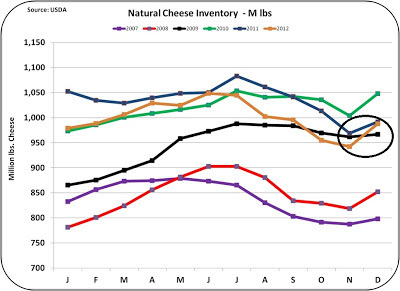 Demand continues to be strong and the supply is limited to the availability from cheese manufacturing. 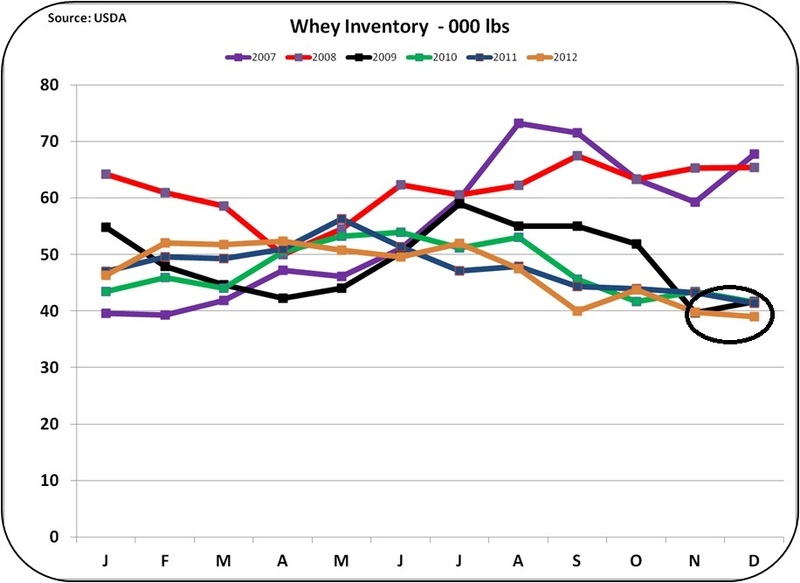 There is little reason to expect these prices to fall to prior levels and there is a reasonable expectation of higher prices as the market for dry whey continues to develop. 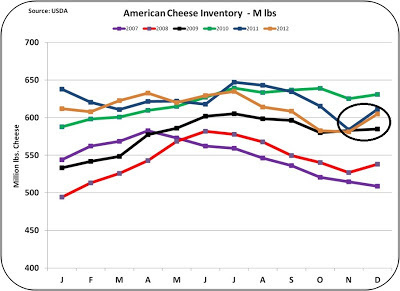 Cheese showed some weakness in exports in November 2012 the last month for which data is available. For the first time in 2012, exports fell below prior year levels. While the current level of exports is still robust, it is a significant decline from the levels of the second quarter. 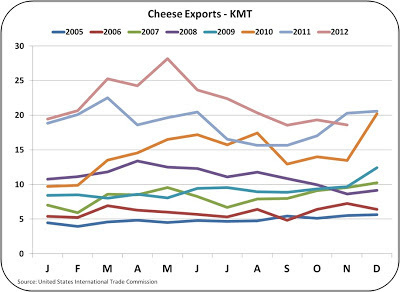 The impact of cheese exports has grown to have a major impact on U.S. cheese disappearance. Unlike domestic consumption which is relatively stable, exports can fluctuate widely from month to month. 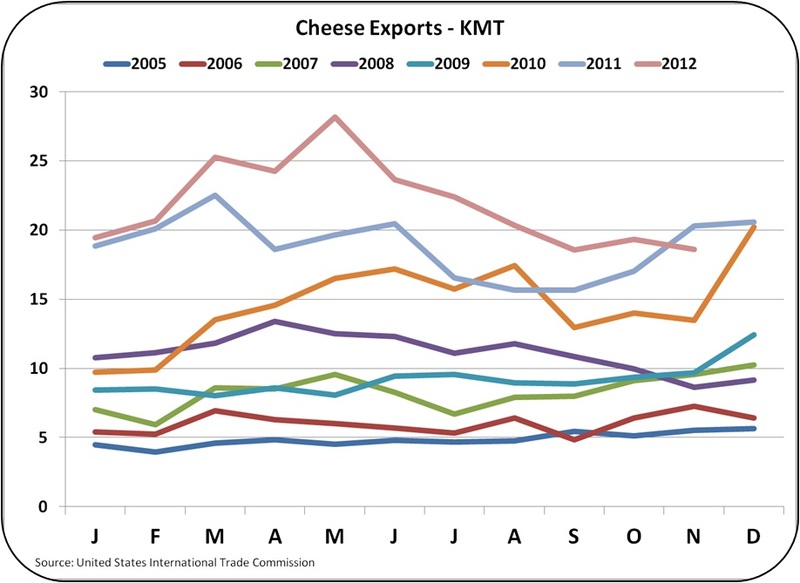 In May 2012, cheese exports were 28 KMT. By November, they had dropped to 19 KMT, declining 34% in six months. This has caused inventories for both Natural and American cheese to swell. 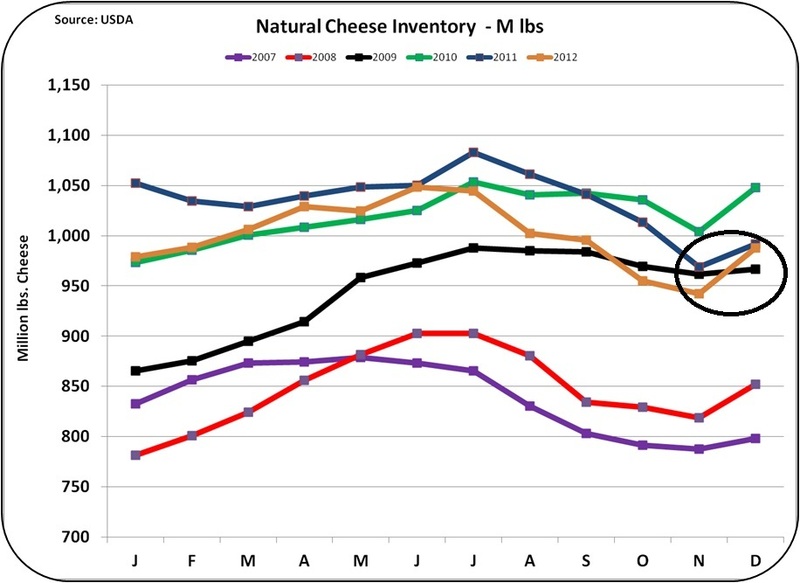 The decline in exports that has occurred could not be responded to quickly by dairy producers and cheese manufacturers, so inventories have grown. The impact on cheese prices has been dramatic. 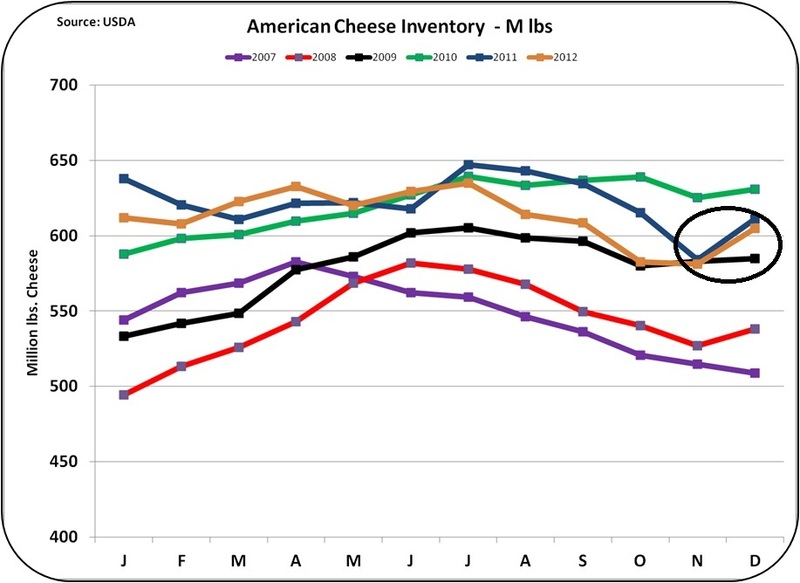 As of February 2, 2012, the CME cash price for cheese barrels was $1.54/lb. Two months ago, the price was over $2/lb. As can be expected, when inventories swell, prices go down. However, exports may quickly grow as the USD has recently moved to a weaker position. As of February 2, 2013, the Euro was as $1.36 (one Euro was worth 1.36 USD), the Australian Dollar was at $1.04 and the New Zealand Dollar was at $.85. These are the major competing currencies for global dairy producers. They all indicate a weakening USD which makes U.S. cheese less expensive on the international markets. 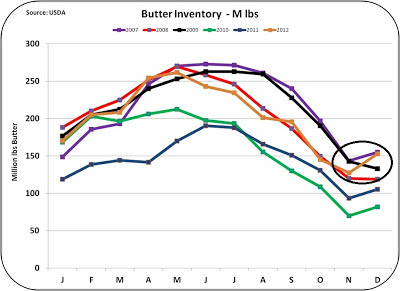 Butter has followed a similar pattern to cheese with inventories taking an unusually high upturn in December 2012. 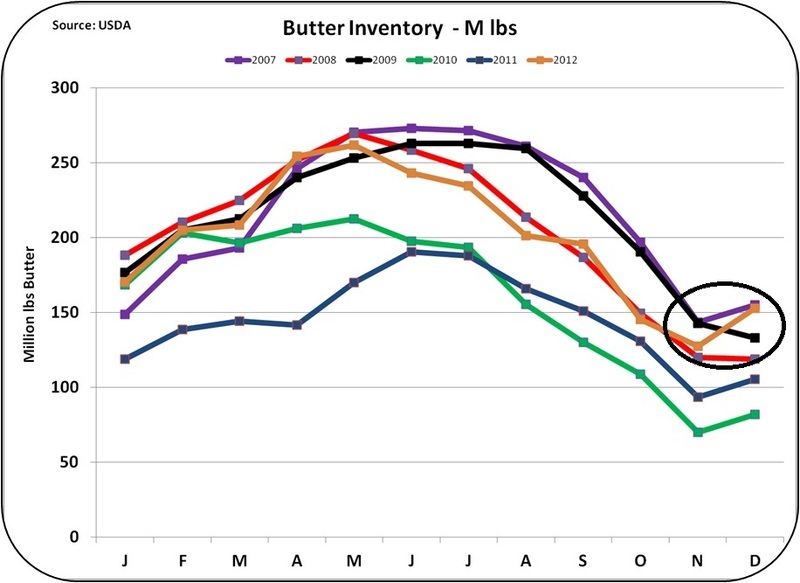 Butter was not having a strong export year like cheese, but nevertheless butter exports did take a dive in November 2012 and this has resulted in higher year end butter inventories. 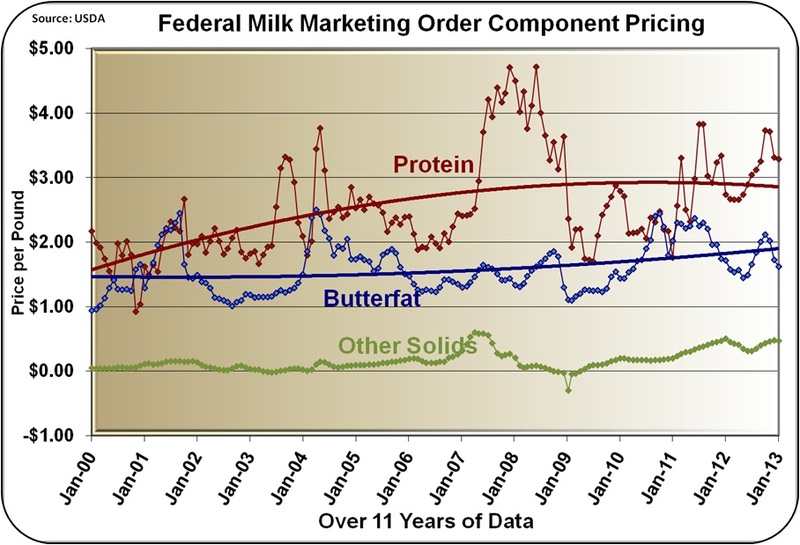 More supply and lower demand have caused butter prices to take a significant drop. 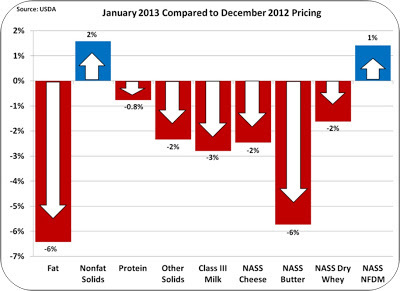 The NASS price for butter fell from $1.60/lb in December to $1.50 in January 2013. HOW WILL THE FIRST QUARTER OF 2013 GO? The fundamentals of an improving U.S. and world economy are favorable for consumption of dairy products. Also, the weak USD makes U.S. products attractively priced in the international markets. However, improved producer milk prices will take a little time. The current futures price for March Class III milk is $16.98/cwt. The excess stocks will have to be depleted before milk prices can rise. With high feed prices and lower milk prices, the next few months look financially difficult.